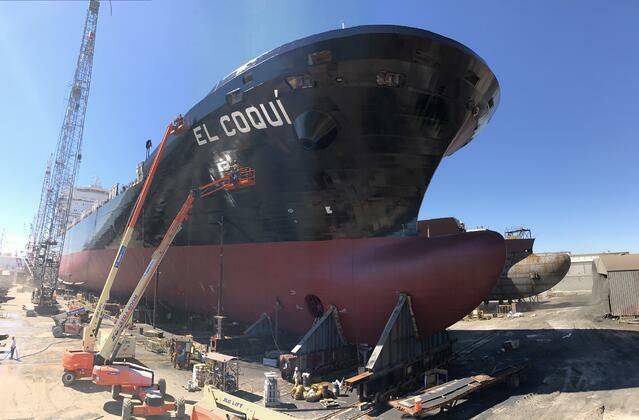 El Coquí continues to progress in summer 2017 as it approaches dock and sea trials in preparation for service in 2018. Workers at VT Halter Marine in Pascagoula, Miss., with Crowley's Marine Solutions construction managers prepared El Coquí for its side launch. Construction workers witness the launch of El Coquí in March 2017 after years of carefully building the LNG-powered ConRo ship. With its launch, El Coquí will undergo final preparations to go into service in 2018. It sister ship Taíno is adjacent as it undergoes construction at the shipyard. 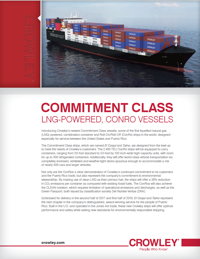 Our Commitment Class ConRo ships, some of the first liquefied natural gas (LNG)-powered, combination container and Roll-On/Roll-Off (ConRo) ships in the world, are designed especially for service between the United States and Puerto Rico. The Commitment Class ConRos, which will be named El Coquí and Taíno, are designed from the keel up to meet the needs of Crowley’s customers. By making use of clean LNG as their primary fuel, the ships will offer a 35% reduction in CO2 emissions per container as compared to existing fossil fuels. Built at VT Halter Marine shipyard in Pascagoula, Miss., and scheduled for delivery in the second half of 2017 and the first half of 2018, El Coquí and Taíno represent the next chapter in the company’s distinguished, award-winning service for the people of Puerto Rico. 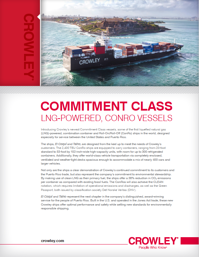 Built in the U.S. and operated in the Jones Act trade, these new Crowley ships will offer optimal performance and safety while setting new standards for environmentally responsible shipping. The ships, which are some of the world’s first to be powered by LNG, are designed to travel at speeds up to 22 knots and carry containers ranging in size from 20-foot standard to 53-foot-long, 102-inch-wide, high-capacity units, along with hundreds of vehicles in enclosed, weather-tight car decking. Learn more about their exciting capabilities with this info sheet. Our commitment to Puerto Rico is marked by state-of-the-art ships, environmentally friendly fuel sourcing, technologically advanced terminal operations, and as always, Crowley’s People Who Know.